Mary's latest garment is this fun asymmetric vest. This Katherine Tilton pattern (Butterick 6357) is full of interesting details, but the fabric really makes it pop. And, surprise! It's an upholstery print! What makes this home dec fabric work for apparel? First, the weave is loose and soft enough to create some drape on the body. Second, this pattern calls for a structured fabric. And finally, the print, though large in scale, visually just works! Mary made some modifications, such as using a purchased bias tape (instead of making bias from self fabric) in order to reduce bulk. The vest has a single side front button closure. Choose a large, unique button to really make a statement! Mary reported that the collar directions weren't quite clear, but she managed to come up with a way to press that wonderful pleated fall into shape. The Grand Old Days Summer Meander is Saturday June 4! Shop & sew at Treadle Yard Goods to benefit Sew Good Goods, a local non-profit dedicated to donating high quality hand-crafted items. Purchase a pre-cut pillow case kit and sew it up right away if you like! No experience necessary. Sewing available in our classroom from 10:00 - 1:00. 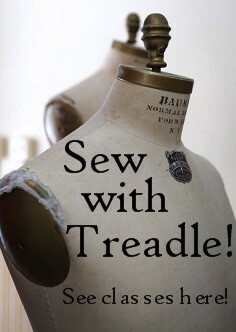 Sewing machines and expert help provided. Pillow case kits available all day 10:00 - 5:00. Trims are the frosting on your sewing project. Add a little detail and make your garment special with the right trimming. We have lots of new selections to choose from! Here are some of our newest white and cream lace edgings. Choose a fine delicate one to edge a bridal veil or create an heirloom project, or use a wider edging to decorate a skirt hem for a petticoat look. If white lace is not your look, take a look at these new lace edgings in black and rich colors! Why use plain old bias tape when a floral bias tape adds such wonderful charm? These single-fold tapes can finish an armhole or neckline, or applique them down like a ribbon. And the polka dot ribbons below are twice as fun - they're reversible! Does your project need a little trim? We have loads of new silks in the store! Whether you're attending a summer wedding or graduation or just want to make something pretty to wear to dinner, silk is the ultimate in dressy and there's a look for everyone's style. These silk charmeuse prints are a delicious eye candy treat! Liquid smooth satin with lustrous colors and tons of drape. This vibrant crepe makes a serious impact! Tone on tone embroidery gives a subtle texture to this silk satin. This crisp patterned jacquard in a floral stripe is rich and formal, with deep colors and lots of body. Finally we have these iridescent shot silk chiffons. Light as air with subtly shifting colors, these make fabulous floaty layers in dresses and skirts, or make a sheer jacket to layer with a strappy top. We have a bunch of new bottomweight fabrics in fun summery prints! This heavier weight is ideal for pants and shorts, but you can also try structured garments like straight skirts and dresses. Jackets and even home sewing would be equally lovely. These first two are cotton with a large, textured weave. We have a few in printed cotton sateen. And a couple in organic cotton with a weave similar to classic bark cloth. There's always more in our store! Stop by and see! We have a sweet new project panel featuring Coral and her underwater friends! Coral is a cut-and-sew doll that transforms into a mermaid with a removable tail. You can also make her a skirt, blanket, pillow, and her little seahorse friend, Mr. Bubbles. All the pieces and directions are included in the panel! Coral's collection also comes with some great coordinating prints! Here is little Coral and Mr. Bubbles sewn up, with her blanket! We have a group of new cottons from Art Gallery Fabrics in gorgeous prints featuring florals, foliage, and a few delightful butterflies and moths. Printed on Art Gallery's Premium Cotton, these are so silky and fine that we have shelved them with our lightweight cotton lawns. They are perfect for blouses, dresses, and skirts! Last week we shared some organic cotton flannel and knit from Cloud 9 fabrics. Today we're showing you more lovely fabrics from Cloud 9 in 100% Organic cotton broadcloth. The array of lovely prints is stunning! Plus you get the good feeling of an eco-friendly fabric. We have some gorgeous new cotton knit jersey prints from Art Gallery Fabrics. The hand is soft and stretchy and the print designs are lovely!